When you are developing a mobile phone application and the size of the application gets too big for handset memory capacity, what can you do? Using SophiaCompress(Java) OASIS, you can automatically solve this problem. SophiaCompress(Java) OASIS is not only easy to use with a well-designed graphical user interface (GUI), but it also provides the highest compression rate in the world. That is why SophiaCompress(Java) OASIS is being utilized by leading game makers, content providers, system integrators and mobile phone carriers. SophiaCompress(Java) OASIS minimizes the size of a Java application by a technology called "class integration" or combining multiple classes into one, sharing all possible data, and removing all data unnecessary for execution. As the size of mobile Java applications gets bigger in general, the number of classes included in an application increases because more functions are necessary. 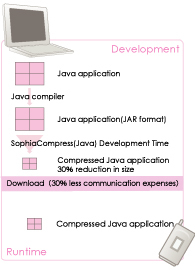 In this situation, SophiaCompress(Java) OASIS is the best solution for developers. All you need to do is select your file and then click the "Compress" button. No background knowledge of Java programming is necessary. SophiaCompress(Java) OASIS compresses a Java application in the compiled JAR format to be run on a handset. It means that you do not need to worry about size limitations when you are writing a program. Using SophiaCompress(Java) OASIS therefore allows source code to be written in a format that any developer can understand. This will make productivity much higher when upgrading the application or when migrating an application to Java specifications for carrier requirements.